Gur hasidim and secular Jews clash violently in the southern city of Arad Saturday night. Long-running tensions between Gur hasidim and secular Jews in Arad exploded Saturday night, as a protest against the Gur hasidic sect deteriorated into a mass brawl between the two sides. 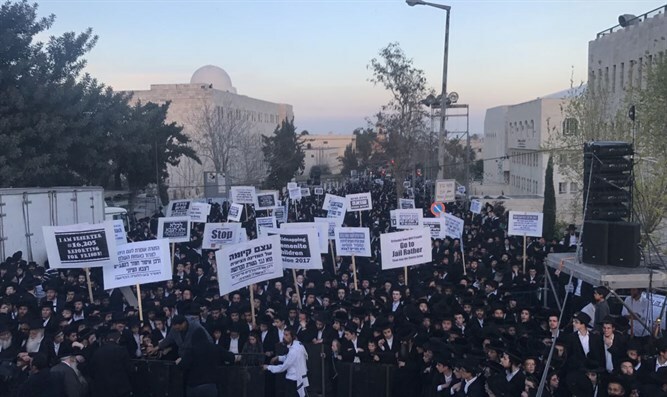 Hundreds of secular residents in the southern city demonstrated against what they view as a hostile takeover of the city by Gur followers Saturday night, after a secular resident was attacked with burning tires by a Gur hasid. Demonstrators chanted "Arad will forever remain a secular city, Arad is ours and we will not relinquish it" and were confronted by Gur followers. The face-off turned violent, as Gur hasidim spat on secular Jews and hurled rocks at protesters. Police arrested two Gur hasidim and two secular residents for their role in the clashes. The secular resident was allegedly attacked after hanging up a large anti-Gur poster reading 'Alter and Litzman, Arad is not for sale.' Alter is the Gur grand Rabbi, and MK Yakov Litzman (UTJ) is Israel's Health Minister and a member of the Gur sect. "Burning tires were thrown at my wife," the secular resident told Ynet. "We put them out, and they started coming in droves. We hung the sign because they're putting up signs against the mayor, so we paid them back in kind. We'll take down ours when they take down theirs." Gur hasidim and secular Jews in Arad have been at loggerheads for years. Secular residents accuse Gur hasidim of attempting to take over the city and harm their way of life, while the local Gur population contend that the city is refusing to provide them with basic municipal services. Tensions aren't just between Gur hasidim and secular Jews - other religious Jews also joined the fray in December after Gur appropriated a prominent city synagogue for their own use.